Trim denim into a 6" x 8" rectangle, iron if needed, then cut into six 1"x8" strips. Mix the fabric medium with the paint according to the directions on the bottle. Use paintbrush to coat one strip with Apple Tart. Do the next strip with Light Orange and continue until you have one strip of each color. Turn the strips over and paint the other side. When dry, cut each strip into thirds. You should end up with 18 thin strips all together. Now cut each of those strips in half. You will have 36 strips measuring approximately 1/3"x4" each. Wrap the denim around a toothpick, hot gluing in segments as you go. Glue the end well. Slide off the toothpick and repeat for all the strips. 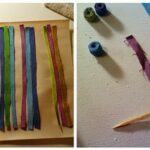 This project for Colorful Recycled Denim Beads was printed from CraftsbyAmanda.com - https://craftsbyamanda.com/colorful-recycled-denim-beads/ and can only be printed for education or personal use.